Chapter I - Many Christians Are Confused About What our Relationship to the Old Testament And Its Laws Should Be. Who Exactly Was Under The Terms Of The Old Covenant And For How Long? The Law, including the Ten Commandments and the Sabbath were given only to the "sons of Israel" (nation) of Israel, '"throughout Israel's generations"
Without the background and history of the Old Testament, we would know nothing about God, sin etc. In fact, the New Testament would make no sense whatsoever. Besides which, much that happened in ancient days serves as a warning and example for us. However, a rather knotty problem arises in the fact that "all Scripture" includes both Old and New Testaments, each of which has seemingly different teachings and commands. 1. Ten Commandments Only: Given the fact that the Ten Commandments are held in such high regard by most Christians and so often prominently displayed on the walls of public buildings, one has to suspect that most people (Christians and non-Christians alike) believe that the Ten Commandments are foundational laws that all Christians must conform to. In fact, many Christians will themselves tell you that the Ten Commandments are timeless moral laws which apply to all Christians for all time, while the rest of the OT law is not applicable to believers today. 2. Moral Laws Only: Other Christians make a distinction between ceremonial, civil and moral laws, the last category supposedly the only one that is still to be observed. In other words, our decision as to which laws we are to follow and which we can safely ignore is based solely on their content. 3. None of Them: Yet others are under the impression that because we are now under the New Covenant, none of the laws and regulations of the Old Testament apply to us. a) Jesus identified the second greatest commandment as being "You Shall Love Your Neighbor As Yourself", which was a direct quote from the laws of Leviticus (19:18). If Jesus said an OT law, that was not included in the Ten Commandments, was the second greatest commandment ever, what basis do we have for arbitrarily rejecting all the regulations in the Pentateuch. 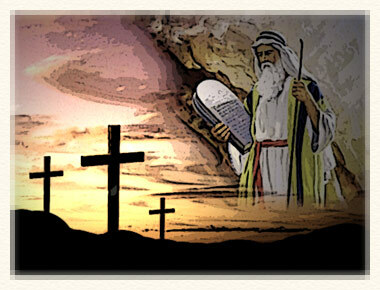 b) How many modern Christians do you know who obey the fourth Commandment? Note: One has to very much doubt that Moses would have accepted Sunday services as a substitute for keeping the Saturday Sabbath that was far more involved than simply going to church for an hour or two. The very term "Sabbath" derives from the Hebrew Shabbat which means "to cease". Starting at sundown on Friday until the appearance of three stars in the sky on Saturday night, the Sabbath severely limits what can be done on that day, but how many people cease from all work that is forbidden on Shabbat? In fact, the Sabbath was taken so seriously that, in the Book of Numbers (15:32-36), a man was executed for gathering wood on the Sabbath. (By the way, this is not a discussion as to why Sunday worship is appropriate). And then there are some Christians who believe that the Sabbath's inclusion in the Ten Commandments means it is to be scrupulously observed. But the question has to be asked... Why only the Sabbath? Yet, some of us believe we should keep the Sabbath, but are not obliged to keep these "holy convocations" I am afraid that the logic completely escapes me as it should anyone who has actually given the matter some thought. And don't get me wrong If you wish to keep a version of the Sabbath and set aside a day of rest that is also devoted to the Father, you are more than welcome to do so. I am sure He will be quite pleased that you esteem Him so highly. What I dispute is that any Christian is obliged to keep the Sabbath . There are those that believe that the content of the law is the criterion by which we decide which of the Mosaic laws are valid for today. In other words, we are to keep moral laws that are considered timeless, but can dispense with ceremonial and civil laws that were given thousands of years ago to a nation that belonged to a time and culture far removed from our own. However, people who believe that only the so called "moral laws" are applicable to 21st century Christians face some insurmountable problems. To begin with, it has to be noted that no such distinction occurs in Scripture, but has been imposed on the text. The Old Testament laws that we have so freely categorized are often found intermixed in the Old Testament. For example, the Ten Commandments are the clearest examples of "moral laws" yet, smack bang in the middle is one that is unmistakably and unarguably ceremonial - the Sabbath law or fourth commandment.. Besides which, the "moral law" of the Old Testament extend well beyond the Ten Commandments. In other places in the Old Testament we find commandments that order adulterers, fornicators, homosexuals and those who dishonor their parents to be put to death. For example..
'If there is anyone who curses his father or his mother, he shall surely be put to death; he has cursed his father or his mother, his blood guiltiness is upon him. 'If there is a man who commits adultery with another man's wife, one who commits adultery with his friend's wife, the adulterer and the adulteress shall surely be put to death. (Leviticus 20:9-10 NASB. See also 11-16). So, what twisted logic dictates that we obey the moral laws of the Ten Commandments, but are allowed to ignore the moral laws in the rest of the Old Testament? Any one who gives the matter some thought will realize that deciding which category many of the laws fall into is not as easy as they may have thought. In other words, the distinctions between civil, ceremonial, and moral laws are far from clear. We make them based on a superficial reading of the text and without clear insight or understanding of the principal behind the law. In our usual fashion we, without giving the matter sufficient thought and study, pick and choose which of the Old Testament laws we will and will not obey based merely on whether a law seems to be relevant. Note the use of the word "all" in Galatian 3:10 mentioned in the quote above. "For as many as are of the works of the Law are under a curse; for it is written, "cursed is everyone who does not abide by all things written in the book of the Law, to perform them." Which, if we are honest with our selves, doesn't find us in a very good position. James reinforced this when he so clearly informed us that anyone who breaks even one of the 613 laws is guilty of breaking them all. In other words, if present-day Christendom is bound by the Ten Commandments, all Old Testament law should be obeyed, including the animal sacrifices, the seven feasts and the thrice yearly visits to Jerusalem. We can not pick and choose which of the Old Testament laws we will obey and which we will not. All of which makes me wonder why it is that you can read a thousand articles on a thousand different websites or blogs about all the reasons that the author believes Jesus did not abolish the law, yet the author never ever claims to follow the whole law. I have wondered how many of these articles were written after a bacon breakfast! Lets get one thing straight right up front. Keeping the Feasts according to the Torah requires offering animal sacrifices. There is no avoiding this conclusion. And, any changes to the festivals by rabbis to accommodate the fact that there is no longer a Temple or Levitical priesthood, or, any changes by Messianic Christians to accommodate the fact that the New Testament says Christ's sacrifice has ended the animal sacrifices, makes it impossible to observe these feasts according to the Torah. What we are left with is a lot of man-made tradition as a substitute to what God commanded. Some of these traditions include things like substituting eggs for the Passover lamb on the Seder. How is this any different from people using "Easter eggs?" Sadly, modern Judaism takes the opinion of man more seriously than Torah. Since the temple was destroyed, and with it all the rituals that revolved around the building including animal sacrifices, the Rabbis (elevated to the status of prophet) decided that prayer ranks higher than sacrifices. They decided that "one who puts on phylacteries, recites the Shema, and offered prayer to God would be regarded as having sacrificed upon the great altar". [See Judaism And The Atonement] A typical example of man having the audacity to think he has the right and authority to change God's laws. Remember that these laws were given to a very tiny nation, the sheer smallness of which made possible the physical keeping of some of the laws, i.e. they could travel to Jerusalem when needed, or when obliged to do so. Once Peter took the Gospel to the Gentiles many of the laws became very difficult to keep. In fact, as the Gospel spread to the furthermost corners of the earth and the number of Christians mushroomed, a huge number of the the Old Testament laws became completely unworkable. The destruction of the Temple dealt the final blow to the physical keeping of the Law. One has to wonder why, if God intended the animal sacrifices to continue, He would let the Romans raze the Temple. However, even if it were still standing and in Jewish hands, how long do you think it would be before the sheer weight of numbers of Christians converging on Jerusalem three times a year, would make the Israeli authorities throw up their hands in horror and shut down the airports. Chaos doesn't even begin to describe the situation. Perhaps, so that we are all on the same page, we should first clarify exactly what a "covenant" is. A covenant is a formal agreement between two parties - one stronger (the suzerain) and the other weaker (the vassal). Both the suzerain and the vassal receive a copy of the covenant that specifies what each party should receive from the other, and defines the penalties for failing to live up to the terms of the agreement. In the Old Testament, the commandments given Israel through Moses at various times (Exodus 20 through Deuteronomy), were not presented as universal and timeless codes of behavior disconnected from the history of the nation. Much to the contrary, it was an integral part of the narrative of God delivering Israel from Egypt and, four decades later, leading them to the Promised Land. The law was a covenant between God and Israel and clearly defined what He would do for them - provided they kept their side of the agreement. The book of Exodus relates how the Israelites were rescued from Egypt eventually arriving at Mount Sinai where they were first called into a covenantal relationship with the Almighty (chapter 19) and given the laws that began in chapter 20. However, as we all know, it didn't take them any time at all to break those laws, showing little trust in the Father. For this they were sentenced to live as nomads for 40 years until that faithless generation died off. Other laws set down in the books of Leviticus and Numbers were given at various points during their wandering through the desert with no fixed abode. The legal material in the Book of Deuteronomy was given a new generation of Israelites just before they crossed the river Jordan and entered Canaan. They received a recapitulation of the covenant that the Father had made with their parents some forty years earlier. In Deuteronomy God specified exactly how they were to conduct themselves in the Promised Land, and what He would do or not do, based on whether or not they lived up to their end of the bargain.. However, there is further supporting evidence. There are two phrases that come up very frequently in the course of the instructions that the Lord gave the nation regarding the various laws and rituals that they were obliged to keep. These two phrases, that often occur in the same sentence, are a) "sons of Israel" that clearly shows who the laws were intended for. The second b) "throughout your (Israel's) generations" shows how long the laws were to stay in effect. is a term used well over 600 times in the Old Testament - over 350 times in the Pentateuch alone. So who exactly were the "sons of Israel"? As we know, Jacob’s name was changed to "Israel" in Genesis 32:28. Later verses make it very obvious that Jacob's sons and grandsons - in fact all his descendants that made up the twelve tribes were known as the "sons of Israel"
It was the "sons of Israel" - Jacobs descendants who were given the law. The Sabbath Was Also Given To The "Sons Of Israel"
Therefore, it makes absolute sense that after the Gospel was preached to the Gentiles and more and more of them became Christians, the Sabbath commandment was not repeated in the New Testament. In fact, the verse below makes it clear that the Sabbath is not applicable to New Testament Christians, at least not to those who are Gentiles. As it says, God delivered the Israelites from Egypt, therefore (or because of that) God commanded them to observe the Sabbath Day. Neither we, nor our ancestors, were slaves in Egypt rescued by God's mighty hand. Six of The Seven Feasts of Israel (Only Rosh HaShanah or the Feast of Trumpets: is not specifically mentioned as being 'throughout your generations'). Misc: The Levites as Priests (Exodus 40:15 and Numbers 18:23), burning incense to the Lord (Exodus 30:8 NASB), sewing tassels on your clothes (Numbers 15:38 NASB), the blowing of the trumpets to convene an assembly (Numbers 10:8) etc. etc. etc. The point here is that the Father expressly stated that all these practices were to continue for the same length of time - throughout Israel's generations. This means that if any of them have ceased - all of them will have done so. While the text does not specify exactly how many years, decades, or centuries that "Israel's generations" entails, it should be fairly obvious that when the Gospel came into effect, the dividing line between Jew and Gentile disappeared, marking the end of "Israel's generation". Yet, the book of Hebrews repeatedly tells us that Jesus is our eternal High priest. Jesus was not a descendant of Aaron but came from the tribe of Judah. As Hebrews goes on to explain - the change in the priesthood meant a change in the Old Testament covenant and the law. However, if we are not beholden to the laws and regulations of the Old Testament, the question arises as to what place the older half of the Bible has in the lives of 21st century believers. After all Paul did say "All scripture is given by inspiration of God, and is profitable for doctrine, for reproof, for correction, for instruction in righteousness (2 Timothy 3:16)." We need to consider that without the background and history of the Old Testament, the New Testament makes no sense whatsoever. We would not know how sin came into the world and how sacrifice is necessary for forgiveness of sins. In fact, come to thing of it, we would know very little about the nature of God and His hatred of evil and virtually nothing about His coming kingdom. We would have absolutely no idea how the Israelites came to be God's chosen people - not only to preserve His words for the generations to come, but also to bring forth the Messiah Himself. The Old Testament also foretold literally dozens of details of His birth, life and death enabling us to properly identify Christ as God's sent one. In fact, the Bible is an integrated whole to the extent that one section cannot stand with out the other; it is totally impossible to properly and completely understand the New Testament without the foundation on which it was built.. In other words, God hasn't changed, neither have His intents and purposes. His wrath against evil hasn't changed, and the fate of sinners and the rewards of the righteous remain the same. We need to pay attention to what lessons the OT teaches us, and be careful to avoid those situations that caused the wrath of God to fall on people's heads. Additionally, if you believe the Sabbath is still binding today, you have to believe that the punishment for violating it is also in effect. Here is what the Lord said about those who failed to properly observe the Sabbath. The Christian Bible Reference Site. What Does the Bible Say About the Old Testament Law? Jason Dulle. The Law: The Misunderstood Covenant. http://www.inplainsite.org/html/the_misunderstood_covenant.htm Pastor Tim Warner. Should Christians Celebrate the Jewish Feasts?